Product prices and availability are accurate as of 2019-04-18 03:25:27 UTC and are subject to change. Any price and availability information displayed on http://www.amazon.com/ at the time of purchase will apply to the purchase of this product. * The Cooling fans can make your computer run more steadily and extend its life. 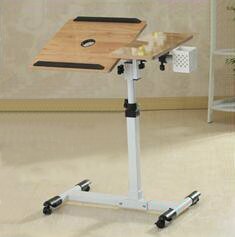 * The laptop desk has lockable wheels which makes it easy to move your laptop or work station to any space in your home, dorm room or office. * The desk has an adjustable height swivel top with the larger section for your computer and smaller section for your mouse. * The tilting desktop makes it convenient for you to use from any angle. * It is suitable for left-handed users. * It's compact and portable so it will take up less space. *The desktop is made from superior wood. *Strut bar is made of stainless steel baked with varnish. *Please check parts and read introductions before you assemble the table. *Be careful when you install the table. *You will get free replacement wheels and extra screws. *Sensible packaging to ensure the item arrives safely. INFINITE TABLE POSITIONS - The height of the desk surface adjusts from 57cm to 95cm to meet your needs. The larger surface has adjustable tilting design. Metallic desktop with cooling fan can make your computer run more steadily and extend its life. You can put it anywhere you need, such as home, office, school, church, conference room, or medical settings. SPECIAL BENEFITS - The powder-coat painted frame ensures years of use and avoids paint peeling, also it's recycled and achieves the goal of environmental protection. 30 Day money back guarantee for any reason; 12 Month warranty for quality related issues; 24 Month warranty for quality issues. There are two lips on the larger surface to keep the laptop from sliding off when the surface is tilted.